Info: Gift a daydream of cloud-like ecru roses and pearly white Asiatic lilies in a vintage-effect vase. With swirling gold leaves, this paper-crafted vase will transport you to an era of elegance and beauty. While the classic truffles in a matching keepsake box will take you on a pleasure-trip of the senses. 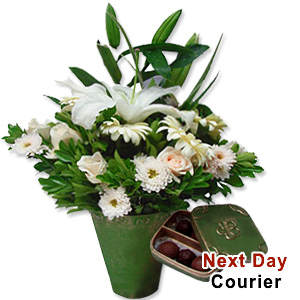 Craft vases come with a matching cover and a plastic container, and may be kept after the blooms have faded, for the recipient to enjoy as a vase, container or keepsake box.